The Sell in May Effect describes the tendency of the market over the six-month period Nov-Apr to outperform the market in the other six-month period (i.e. May-Oct). 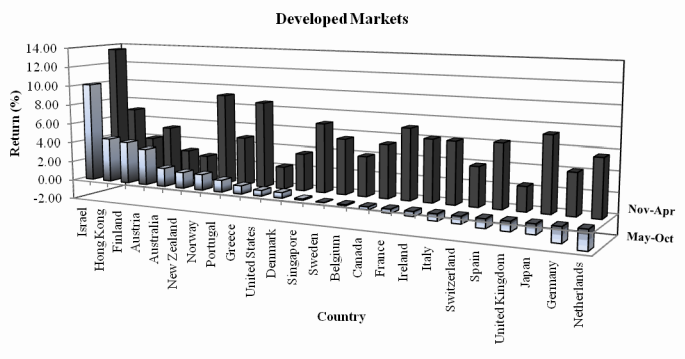 The effect can be seen in the following chart, which plots the cumulative average daily returns of the market (i.e. it gives a representation of the market moves in an average year). More information on this chart can be found here. As can be seen the market tends to be strong from November to April, and then flat for the six-month period May to October. An update tracking the accuracy of this effect can be found here, and further articles here. Although the effect is statistically significant, it is not an easy anomaly to exploit economically. In theory an investor might be long stocks Nov-Apr and then move to cash for May-Oct. But as can be seen in the above chart, the market doesn’t necessarily fall in the summer period (except possibly the short May-Jun period), rather it is flat. And by moving to cash the investor would forego dividends paid in the May-Oct period. It may make sense moving to cash if interest rates were high (i.e. to benefit from high returns on cash for the summer period) – but that is not the case currently. And in any case that has to be balanced with the fact that when interest rates are high expected growth rates in equities tend to be high as well (i.e. not a time to be out of the market). One significant reason why it may make sense to be out of the market over the summer period is that volatility is much higher then than in the Winter period (as shown here). For example, eight of the ten largest one day falls in the FTSE 100 Index happened in the Summer period. Hence, not only are returns lower in the Summer, but also risk-adjusted returns are significantly lower. But generally, this is a little frustrating: the Sell in May Effect is a significant market anomaly, but tricky to exploit. One idea is to stay in the market throughout the year but to re-balance a stock portfolio according to which sectors perform the best in the two six-month periods as defined by the Sell in May Effect. The following two tables show the performance of the FTSE 350 sectors in the respective summer and winter periods since 1999. The tables have been ranked by average returns of the respective sectors over the 17-year period. From these tables two portfolios of sectors can be constructed that have historically performed strongly in the respective summer and winter periods. 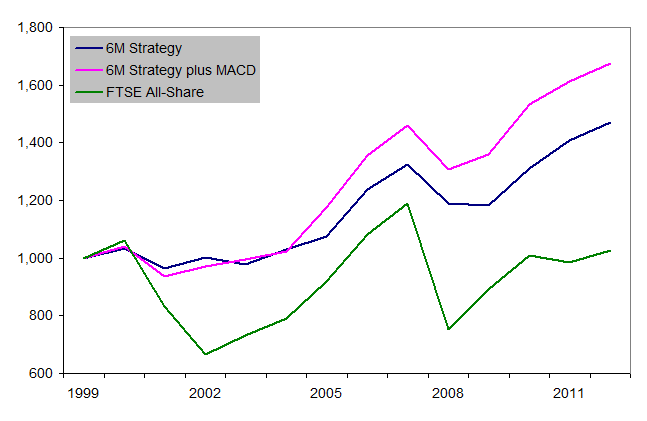 The following chart shows the simulated performance of the Sell in May Sector Strategy backdated to 1999 compared to the FTSE 100 Index. After 17 years the SIMSS portfolio would have grown in value to 1021 (from a starting value of 100). While the FTSE 100 (buy and hold) portfolio would have grown to 111. This simulation does not include transaction costs, but as the strategy only trades twice a year these would not significantly change the above results. More articles about the Sell in May Effect. Sell in May and come back…when? The old saying goes “sell in May”. But if you sell in May when should you come back into the market? Well, in its original form the adage was, “sell in May and go away, don’t come back till St Leger Day”. And St Leger is the last big event of the UK horse-racing calendar, and usually takes place in mid-September. 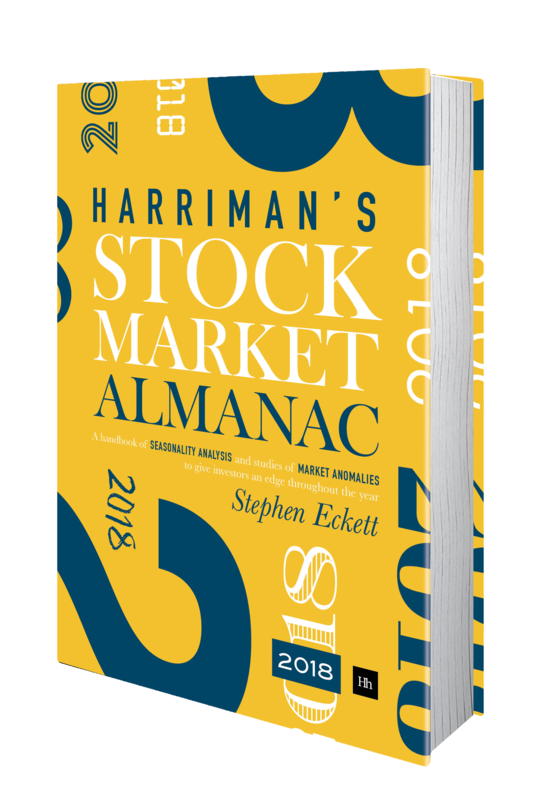 A complementary anomaly (most likely originating in the US) is the Halloween Effect, which holds that stocks see the bulk of their gains in the six-month period 31 October to 1 May. At some point it seems the sell in May saying and the Halloween Effect merged to become one. Such that today the sell in May adage is usually taken to mean that the summer period of (relatively) poor returns ends 31 October. So, so far we have possible entries back into the market of mid-September or end October. What does the recent data say? 1 November – 30 April (Winter period): when the market tends to rise. The data does support the claim that the greater part the market’s gains come in the Winter period. Over the whole six-month Summer period the market doesn’t necessarily fall, but it does tend to be flat, and certainly the returns are less than in the Winter period. However, it can be seen in the chart that the market is absolutely weak for the two-month period May to June. So, according to the data since 1984, if you do sell in May, one time for coming back into the market would be the end of June. More articles on the Sell in May Effect. In the six months Nov 2015 to Apr 2016 (Winter period) the FTSE All-Share Index fell 1.8%. Previously, the Index had fallen 7.3% over May 2015 to Oct 2015 (Summer period). The outperformance of the Winter market over the Summer market was therefore 5.5 percentage points, which supports the Sell in May Effect. 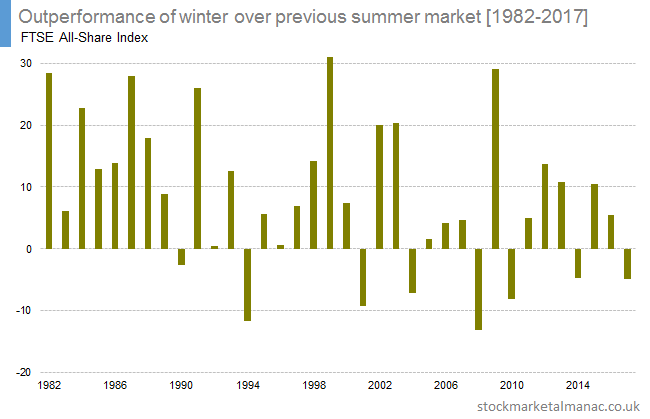 The following chart shows the outperformance of the FTSE All-Share Index in the Winter period over the previous Summer period since 1982. 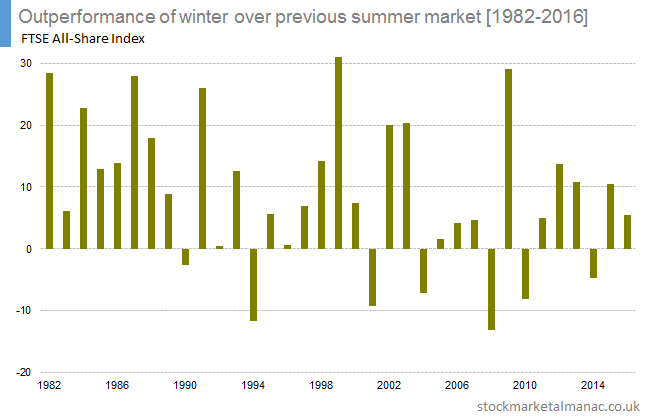 In the 16 years since 2000 the Winter market has outperformed the previous Summer market 11 times, with an average outperformance of 5.2 percentage points. Other articles on the Sell in May Effect. The Sell in May effect (also known as the Halloween or Six Month effects) describes the tendency of the stock market to perform strongly in the period November to April in comparison to the period May-October. This effect has been observed in markets worldwide and has existed for many decades. Winter portfolio – is 100% invested in the FTSE All Share Index only in the months November to April (and is out of the market for the other half of the year). Summer portfolio – is 100% invested in the FTSE All Share Index only in the months May to October (and is out of the market for the other half of the year). The following three charts plot the performance of the three portfolios to the present day from 1984, 1994 and 2004. As can be seen the divergence in performance between the Winter and Summer portfolios is quite remarkable. The following chart partly summarises the performance by plotting the CAGR (compound annual growth rate) for the portfolios over the three periods. The two features to note are the CAGR for the Winter portfolio is greater than the CAGR for the All Year portfolio for all three periods, and that the CAGRs for the Summer portfolio are negative for all three periods studied. The following chart shows the volatility of the three portfolios over the three periods. In this case volatility is calculated as the standard deviation of the portfolio daily returns. The features to note here are that the Winter portfolio consistently has the lowest volatility in each period, while the Summer portfolio has the highest. An explanation for this might be that the most volatile period of the year for the stock market has historically been September-October. So, beyond superior returns, a feature of the Winter portfolio is that it avoids the most volatile period of the year.. The following chart to some extent combines the previous two into one by plotting the Sharpe Ratio for the three portfolios over the three periods. The Sharpe Ratio is one method of measuring the risk-adjusted returns of a portfolio. With its superior returns and lower volatility the Winter portfolio can be seen to quite easily have the highest Sharpe Ratios for all three periods studied. Does the FTSE 100 Index display a monthly seasonality? The highest average return was seen in April (+2.2%), closely followed by December (+2.1%). The lowest average return was in September (-1.1%). 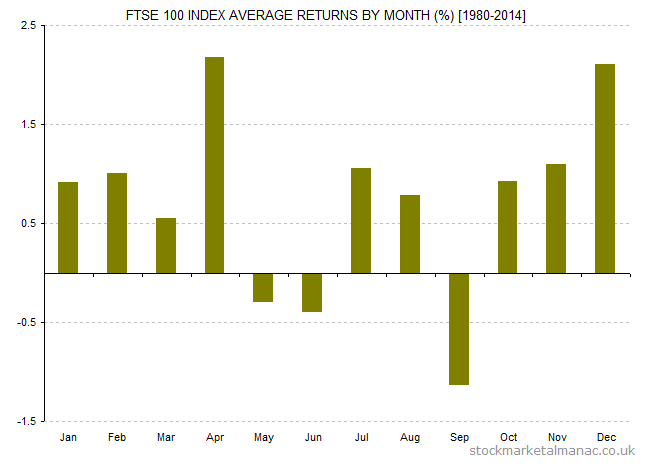 Only three months (May, June, September) had negative average returns over the period. The Sell in May (Halloween) effect can be seen illustrated here: the period May-Oct is the weaker half of the year, and Nov-Apr the stronger half. 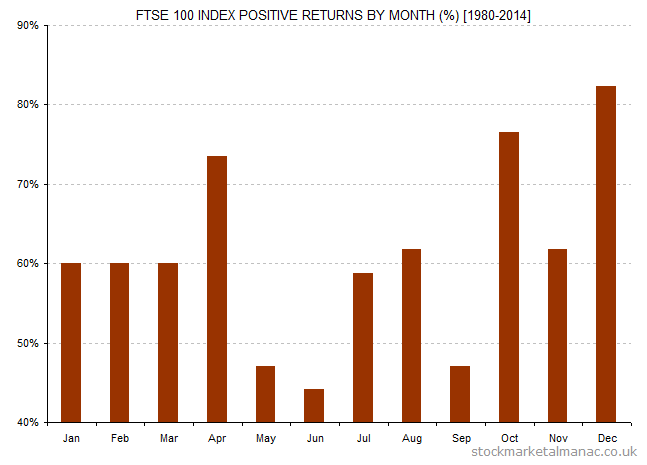 The following chart plots the proportion of monthly returns that were positive for each month. For example, the index rose in April in 74% of the years since 1980, and in 47% of the years for May. As can be seen the overall relative profile of strong/weak months is the same as that for the average performance figures. 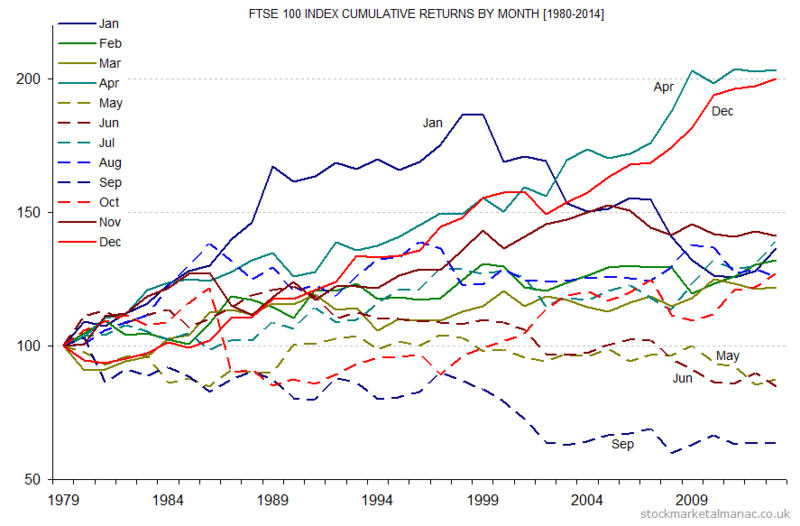 The one difference is October: here the month has the second highest proportion of positive monthly returns, but (from the first chart) ranks only sixth in terms of average returns. 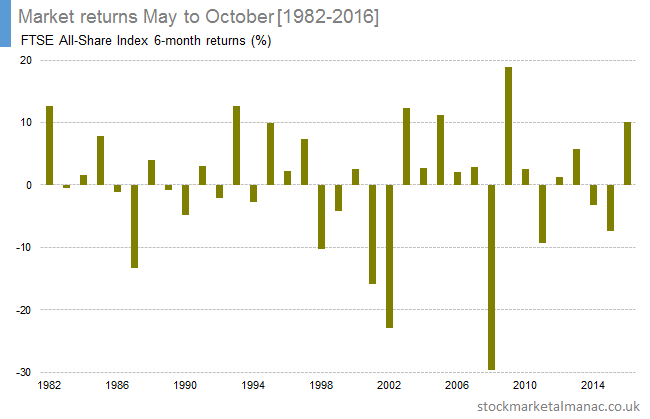 This reflects the fact that the market is generally strong in October, but its average return is brought down by the occasional very large falls in the month (e.g. 1987). The following chart shows the cumulative returns indexed to 100 for each month. 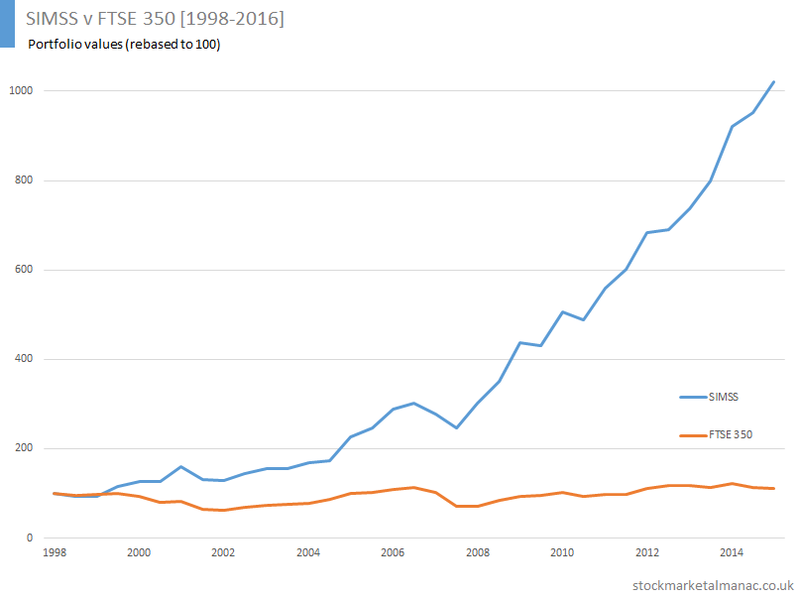 For example, £100 invested in the FTSE 100 only in the month of April over the period 1980-2014 would have grown to £203, while in May £100 over the 34 years would have fallen in value to £88. The six months of the weak half of the year (according to the Sell in May effect) are indicated with dashed lines. The observations from the first two charts (i.e. the strength of Apr and Dec and the weakness of Sep), can be seen clearly in this chart as well. Historically, January was the strongest month of the year (and this is still the case in some countries).As can be seen, January was the strongest month for the FTSE 100 Index until the beginning of the millennium, since when its performance has fallen off quite dramatically. Until 2005, November’s cumulative return was close to that of December’s. The low volatility and close correlation of April and December returns are striking. Very broadly, the collection of dotted lines towards the bottom on the chart supports the Sell in May effect (i.e. the market is relatively weak May-Oct).